Should I Stay in a B&B or a Hotel? Once you’ve decided to forgo the sterile hotel for the interesting B&B, how do you choose among the variety of rooms to meet your special needs. 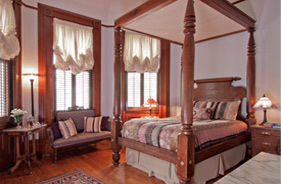 The Innkeepers in New Orleans proclaim there are “Two Hundred Rooms; No Two Alike.” We may be biased, but we believe the Grand Victorian Bed & Breakfast is the best place to stay in New Orleans. Our Garden District bed and breakfast offers eight unique rooms, all named after local plantation homes. Here are some suggestions from the Grand Victorian staff on finding just the right room for you. 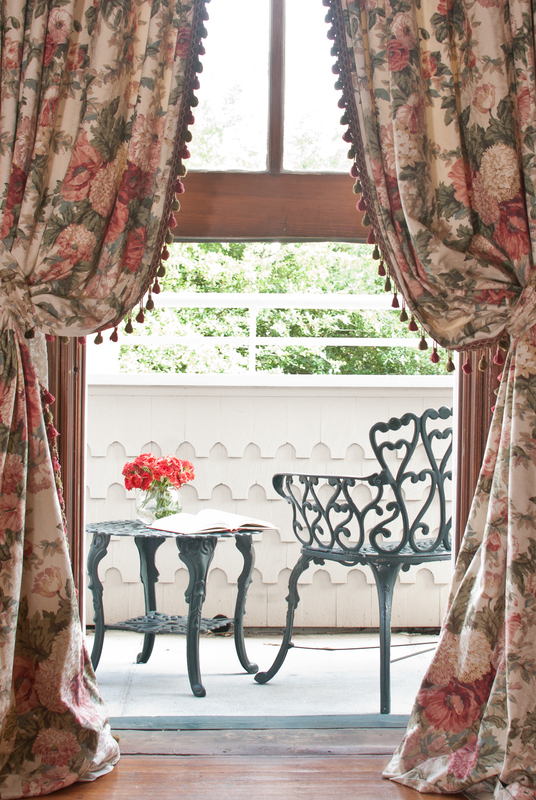 If you are planning a romantic getaway, then the Nottoway Suite is for you. Separated from the rest of the house by an extra doorway and stairwell, Nottoway is known as our honeymoon suite and is popular among our New Orleans elopement couples. If you prefer one of our deluxe rooms, the deep hues and bay windows of the Shadows Room are also a favorite with couples. For a quiet place to read and rest, the two rooms farthest from the street are Destrehan and Magnolia. You can still hear some of the rattle of the streetcar, but these century-old thick walls drown out most everything else. If you are traveling with a third person or would like to sleep separately (all rooms have only one bed), we have several rooms that are large enough for a rollaway cot: Oak Alley, Greenwood, Magnolia, Evergreen and Nottoway. Please note that we go to great lengths and many layers to create a comfortable bed here. Our rollaway mattresses simply cannot compare, but are available as a convenience. End your day with a long hot bath in one of our suites, Greenwood or Nottoway. Each have large European style jacuzzi bathtubs good for a soak with wall-mounted handheld attachments for a shower. All of our rooms have bathtubs with showers except for Evergreen which has a shower only. If you are a vintage buff, try the old cast iron tubs in Rosedown, Shadows, or Destrehan. Don’t like stairs? We have two rooms on the first floor: Rosedown and Oak Alley, plus a ramp that leads to the front door. Rosedown houses our “Princess and the Pea” bed because it is high and requires bed stairs to climb in. Oak Alley is ADA compliant with an accessible bathroom and low queen size bed. Also note that our Nottoway suite has an extra and private set of stairs that takes you down into the room. Because it was added onto the back of the original house in the 1940s, the ceiling height below is not the same 14′ ceilings as the rest of the house. Are you a tall traveler (over 6 feet)? Then choose one of these rooms without a high footboard on the antique beds: Rosedown, Greenwood, Magnolia, Shadows, Destrehan or Nottoway. The Shadows Bed has plenty of leg room. Girlfriends traveling together would appreciate the roomy bathroom of the Magnolia room or the expansive window bench in the Evergreen Room, good for sitting, reading, talking or spreading out your stuff. Both spots also comfortably fit a rollaway in case you don’t want to share a bed or you are a group of three. For taking in the street scene, choose one of the suites with private balconies. The Greenwood Suite overlooks the streetcars along St. Charles Avenue and is a great people-watching spot! Nottoway’s balcony is more private and has a quiet view of the neighborhood. What is a “plantation sized bed“ you ask? Because our furniture is all from the turn of two centuries ago, there were no “standard” bed sizes. These beds are all unique in length and width, each with a custom-made mattress. They all fall between a full and a queen by modern standard definitions. You can also customize your bed with a choice of feather or foam pillows and choose to sleep with or without the feather-top mattress. If you are sensitive to light, choose the shaded rooms: Rosedown, Magnolia, Destrehan or Nottoway. If you need some sunshine to get going, try Oak Alley, Greenwood, Shadows, or Evergreen. Lastly, if you are traveling with a group of friends or family members, we have three great hangout spots available. 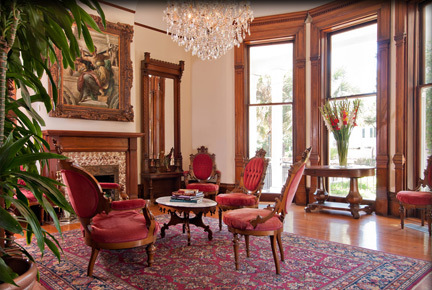 You can talk and view the street scene in the parlor, have a glass of wine on the porte cochere balcony, or play cards in the dining room. Catch the street scene views from our front parlor. You might just get inspired by your room or the carved painting of it’s namesake plantation home. If so, several of the plantations are still open for tours: Oak Alley, Evergreen, Destrehan and Nottoway. Wherever you sleep in the Grand Victorian, you are sure to have a wonderful experience and great memories of the Garden District of New Orleans. 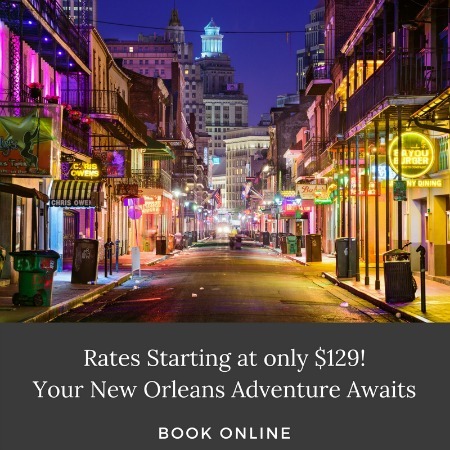 Call or email us today if you have any special needs and would like help choosing the perfect room for the perfect New Orleans vacation at the Grand Victorian Bed & Breakfast. This entry was posted on Tuesday, February 18th, 2014 at 4:51 pm	and is filed under Travel Tips. You can follow any responses to this entry through the RSS 2.0 feed. Both comments and pings are currently closed.